Click on image to load the English press release. Those of you following the Kenwood TS-990 will be happy to know that Kenwood has finally published an official press release with specifications and other details. They are announcing a suggested retail price of ¥798,000, or $9,138.78 US as of day of posting. They offer the same price for the TS-990S (200 Watts) or the TS-990D (50 Watts-Japan only). Kenwood has publicized a launch date of February 2013. This entry was posted in Announcements, Product Announcements and tagged Kenwood TS-990, Kenwood TS-990 Press Release, Kenwood TS-990D, Kenwood TS-990S, TS-990, TS-990D, TS-990S. Bookmark the permalink. 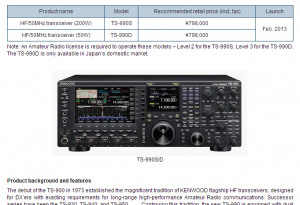 Not sure I’d say that I am happy that Kenwood has announced a price of 798,000 yen for the ts-990s. Probably more dissapointed than anything. But it’s in line with my expectations despite many web sites, including yours, saying it would be in the 5-6K range. Much too expensive for the majority of hams. I think that price is steep, indeed. Kenwood has been flaky about the price since they announced the 990. I know many DXers who wouldn’t think the price tag is excessive. However, with transceivers like the Elecraft KX3 who, at $1K US can top Rob Sherwood’s charts, the big three will need to re-think their high end pricing and architecture. I no longer see as many Icom/Yaesu and Kenwood rigs in DXpeditions, I see the Elecraft K3. I love Kenwood, but I would not buy the TS-990. Too happy with offerings like The Orion II, Eagle, KX3 and K3 that could probably compete at half or less the cost. Comparing the announced prices, if I was a ham in Spain (9035 euros) I would take a trip to Germany, but one the (7495 euros), and have a wonderful vacation (in Italy of course) with the difference. If it was me, I would also apply for a refund of the VAT, something Americans can so but I am not sure Europeans can do. No price anounced yet in the U.S. but I am expecting it to be around $8500 plus tax. Just my guess.